Don’t worry about missing important calls during non-business hours. The Bogen NR100 converts a building's paging systems into a telephone ringer to alert anyone in the building of an incoming call. Non-business hours are when the least amount of personnel are in a building. The only people that may be there are security guards or some hard working employees. With only a few people in the building, they might not be near a phone to hear it ring. This is especially true with security guards that patrol the building at night. This could result in them missing an important phone call. Telcom & Data is proud to carry a product that alerts the entire building of an incoming phone call. The Bogen NR100 Telephone Paging System Night Ringer allows for a tone to be played through a building’s paging system when a call is coming in. The Bogen NR100 is a Telephone Paging System that converts paging systems into an after-hours night telephone alert system. The NR100 night ringer sends an audio alert through paging system speakers when triggered by the telephone system’s night bell circuit. This eliminates the need for expensive and old-fashioned night bells throughout a facility. The NR100 is an easy and efficient way to alert security guards or other personnel of incoming calls during non-business hours. The NR100 offers protection against missed calls at a low cost. Low current draw makes the system affordable to run and operate. The no maintenance system is easily connected to the AUX input of a paging amplifier and can be activated by either 90V ring or contact closure. Connections are included for a background music source. When the ringer is activated, the background music is automatically muted. The unit is rugged and compact in design and has flanges for easy wall mounting. The NR100 complies with Part 68 of FCC rules. 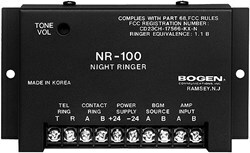 For more information on the Bogen NR100 Telephone Paging System Night Ringer, visit Bogen-paging.com or call 800-335-0229. About Telcom & Data: Since 1996 Telcom & Data has been providing thousands of telecommunications solutions to organizations around the world to measurably improve communications. The company is a leader in business phone systems, intercom systems, and mass notification products. Telcom & Data maintains a network of over 1600 technicians with locations in Chicago, Milwaukee, and Miami.